As always we have three wonderful stories and beautiful illustrations. I loved the picture that had the ice flowers. My favorite part of Oliver's books are the wonderful stories he tells. In his first story "Ice we find Oliver preparing for a day of ice skating. He tries to help Joey learn to skate. It only took a second of looking away for Joey to find himself in trouble. Who will save him? In "Mice Chase" we are reminded that Oliver is allergic to eating mice. To stay in shape his mouse friend Mausi allows Oliver to chase him. But now it is Mausi who needs Oliver's help. His chidren are now teenagers and need to learn how to avoid being caught by a cat. Can Oliver help Mausi teach his children these valuable lessons? "Dragon Heat" takes us back to ghost castle for another adventure. Once Oliver and Jumpy step through the door of the castle they are shocked to step into a burned out land. They look around and find a giant ant mail lady. Even though there are no houses left to deliver the mail, she continues. When Oliver asks what happens to the mail, she tells him she reads them because if not "the words are unhappy". I absolutely loved this line of thought. They meet a giant they had helped once before. He asks them to help him capture the dragon who burned the land. Will they succeed or get burned? What will happen to the dragon if they capture him? 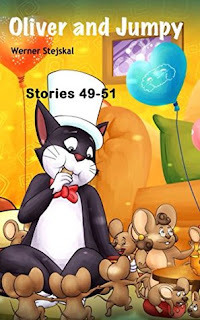 These are wonderful and simple stories that every parent and grandparent should read to their children or grandchildren. I highly recommend them.